Christopher Hails: Just taken delivery of 500kg. All I can say about this product in two words - Utterly brilliant. Thank you and I'll be ordering more next month. Christopher Hails: ...and I have. E mailed this morning and delivered this afternoon. First class service. These briquettes far outclass other wood fuels. My chainsaw has retired early. Thank you. THE ONLY SHOP IN CYPRUS WITH FAST FREE* DELIVERY TO YOUR DOOR! These fittings are designed to connect 2 metric series PE pipes to threaded inlet or outlet (imperial, inches) with 90 degrees angle (TEE). Female adaptor has a compression fittings on two sides and threads on inside surface of tee 90 deg . These fittings are metric series suitable to use with metric series of pipes (when the size standart is shown in centimeters "cm"). 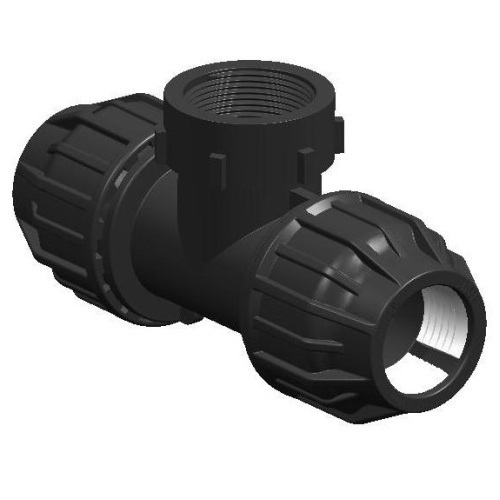 Made from high quality, UV and weather resistant plastic, these fittings are suitable to use in systems exposed to sun. Plastic components are highly resistant to chemicals and require no maintenance. Rubber O-Ring and fitting structure makes it easy to install and prevents leaking. Suitable to use in Low- and High- pressure systems. Our concept is to present wide range of products to fit your needs. We supply only "best value for money" products to compete the existing market prices. We offer free island-wide door delivery for our products. We give you 100% money back guarantee within 14 days. You pay cash on delivery.